Software simulations are usually not so complex to cover all situations and problems that can occur in real world environment. We are developing a framework that allows us to verify the functionality of algorithms that control a team of autonomous unmanned systems. These algorithms are designed for heterogenous multi-agent systems and their deployment on hardware robots allows us to further improve their stability and robustness. Area of unmanned systems unifies most of the ATG research - from trajectory planning, collision resolution, multi-agent planning for tactical missions, optimal resource allocation, game-theoretical modeling of adversaries to critical infrastructure protection or simulation of multiple agents in mixed-reality environment. The research in ATG is dealing with both aerial and ground unmanned systems. Unmanned Aerial Systems (UAS) are becoming increasingly popular for tasks such as surveillance or target tracking in various types of tactical missions. Traditionally, each UAV (Unmanned Aerial Vehicle) in a mission is controlled by one or more operators. We have developed a collection of distributed algorithms that allow one operator to control a whole team of small UAVs. 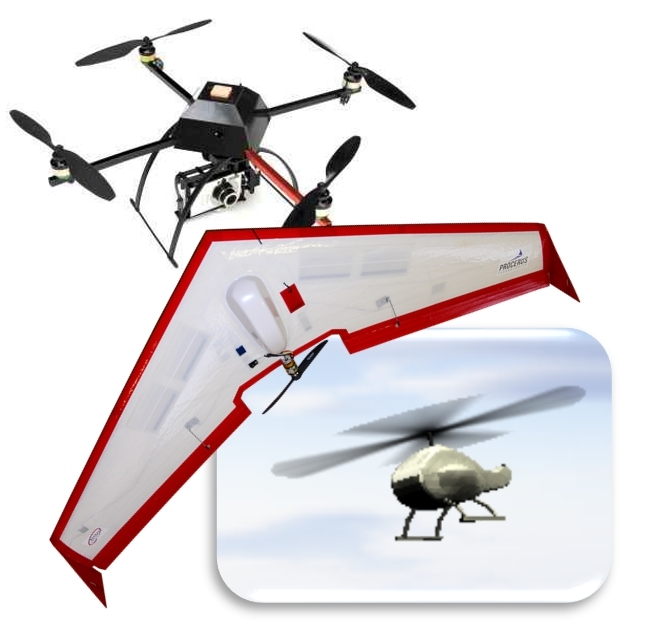 We are able to deploy the developed multi-agent control algorithms to a team of heterogenous hardware UAVs or to reduce costs and risks, we are capable of performing mixed reality simulations where the real and simulated UAVs can co-exist in one environment thus increasing the scalability and fidelity of our simulations. 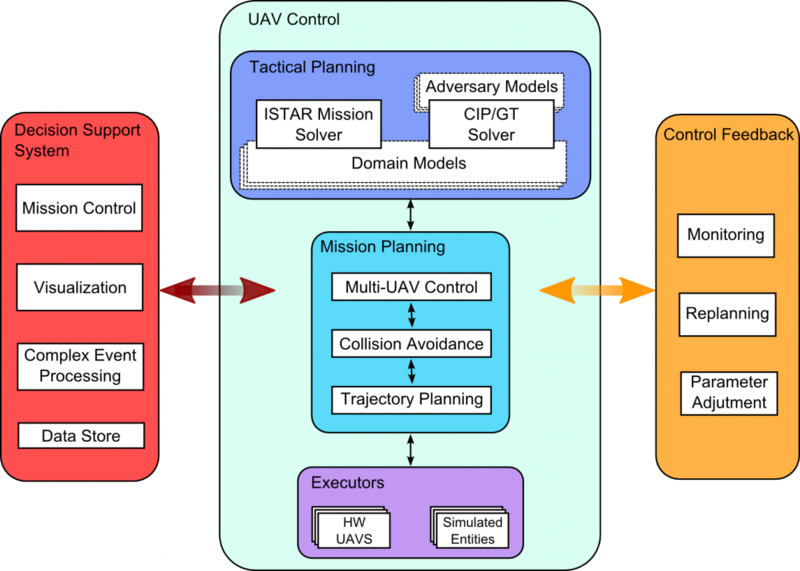 Low-level mission planning that deals with trajectory planning in dynamic environment, control of multiple UAV assets and collision avoidance among them. We use trajectory planning techniques like RRT*, Adaptive A*, modified A* for planning in wind, and collision avoidance mechanisms like ADPP or Peer-to-Peer negotiation. High-level task planning in tactical domains, which consists of (i) algorithms for solving ISTAR (Intelligence, surveillance, target acquisition, and reconnaissance) in team of autonomous heterogenous assets and (ii) game-theoretical algorithms for modeling of adversaries and optimal asset allocation for protection of critical architectures. Decision support system for complex mission control, complex event processing and visualization of mission execution and real-time mission video and other sensory data. Fixed-wings are cap able of relatively fast flight (up to 30 m/s) and have relatively large flight endurance (usually 30+ mins) and their are suitable for missions, where large areas need to be covered by limited number of assets in short time, e.g. wild-fires or floods monitoring or in the agriculture applications. We have two fixed-wing Procerus UAVs with Kestrel autopilots at our disposal that we can control via Kestrel proprietary protocol. VTOL (Vertical Take-off Landing) rotary UAVs have usually less endurance (usually up to 15 mins) and are slower than fixed-wings, however their large advantages are the possibility of loitering at one place, easier take-off procedure or unbounded minimal speed of flight or flight altitude. 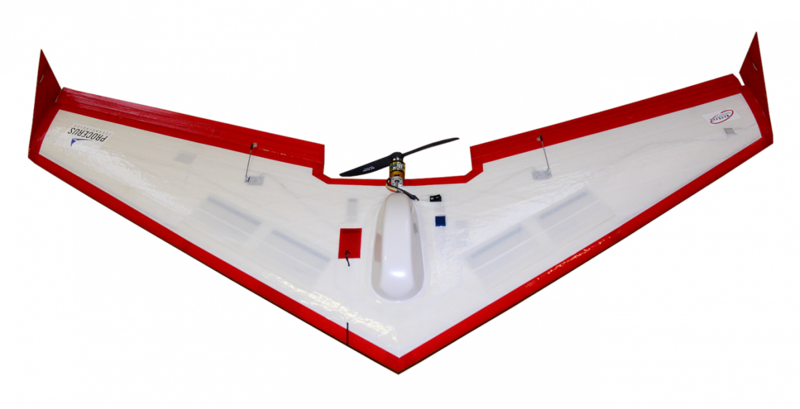 They are suitable for missions where low-altitude flights in environment with lots of obstacles are required or when precise tracking of slow moving targets in low-altitudes is needed. 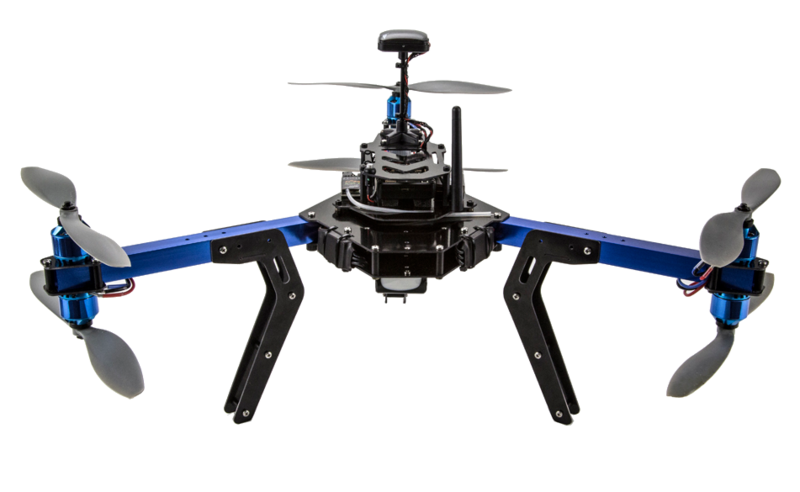 We use 3DRobotics mutli-rotors (Quadcopter, Hexacopter or Y6 multi-copter) with APM2.6 autopilots that we interface via MAVLink protocol. To increase the autonomy of UAVs and to maximize the amount of information from unmanned missions, the UAVs are equipped with various payload. RF modems for UAV-to-UAV or UAV-to-Ground Station communication and video. We are experimenting with several 2.4 GHz RF modules from various vendors, such as XBee DigiMesh 2.4GHz modems or Microhard nVIP2400 that provides medium access control features for simultaneous communication of multiple UAVs. 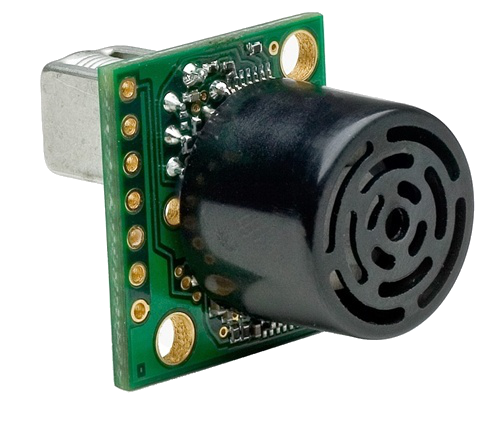 Camera sensor for surveillance, target tracking, mapping etc. 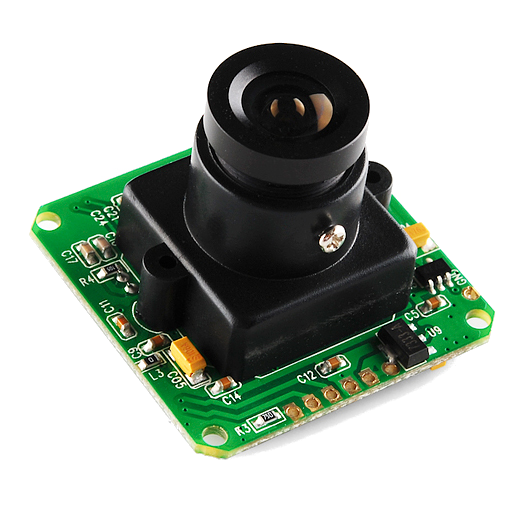 We use various camera sensors from webcams to cameras on chip or GoPro cameras. Simulation - The simulated mode of execution uses purely simulated embodiment with a simple dynamic model of the UAV. It is possible to run the simulation either in single JVM, or to run each UAV in its own dedicated JVM as well as the ground station. In simulation, those two modes does not differ greatly, but they correspond to the remote and on-board HW modes (mainly in the configuration of the ground station, used sensors and actuators), therefore it is important to test both variants. SIL - SIL is an acronym for Software-In-Loop mode of execution. The Ground Station software (Virtual Cockpit or MissionPlanner) has an ability to simulate a 6 degree of freedom UAV through the use of a 3rd party simulators. In this mode all the UAVs' parts are simulated (autopilot, sensors, modems, weather) but we can use it to run tests with our software components designated for the hardware embodiment. This mode serves as a first stage before any deployment on hardware. HIL Remote - HIL is an acronym for Hardware-In-Loop mode of execution, while “Remote” means, that a Remote-control implementation of the embodiment is used. 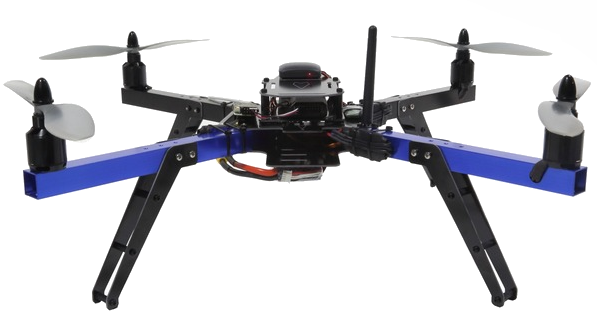 In Hardware-In-Loop, the real HW UAV (specifically its autopilot) is connected to a software simulator, which simulates the flight and feeds the UAV’s sensors, and it is controlled from the ground station as it would be in the field. In the Remote-control implementation of the embodiment and remote configuration of the ground station, all logic of the UAVs is run locally on the ground station and the UAVs are commanded via the command (radio) link by setting the waypoints, operation modes etc. The difference between the simulation and HIL Remote is therefore mostly in the execution of plans by the real (Kestrel, APM, Pixhawk, ...) autopilot and more detailed physics provided by the simulator. 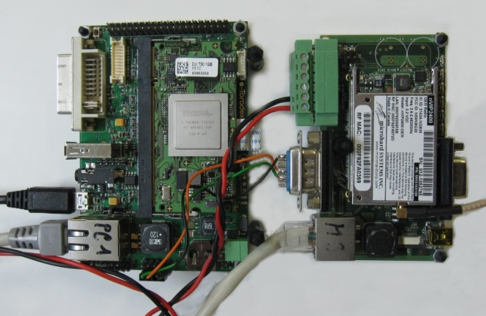 HIL On-board - on-board in this context means, that the logic of the UAV runs on the hardware UAV (on-board Gumstix COM / Colibri T30) exactly as it would run in the real field test. The main difference between this mode of execution and the field test is, that the UAVs are near to each other, static and without motors running, which makes the communication more reliable and less error prone, but the communication issues are still present in more complex scenarios. HW Remote - all logic of the UAVs is run locally on the Ground station and the UAVs are commanded via the command (radio) link by setting the waypoints etc. The UAVs themselves are deployed in air, experiencing all difficulties such as variable wind, imprecise execution, etc. There are no issues with the communication, because the planning algorithms run locally and the only communication act is the sending of waypoints and receiving telemetry via the control channel. HW On-board - all logic of the UAVs run autonomously on-board of the hardware UAV (on-board Gumstix COM / Colibri T30). This is the most challenging mode of operation, because we have to deal with the sensor imprecision, nonlinear behavior of the autopilot, weather, unreliable communication and limited computational power. The biggest issue of this mode is the air-to-air communication between pairs of UAVs on distances larger then several meters in presence of radio frequency noise.